Heroes and Horses is a Montana-based nonprofit organization that has created an innovative, three-phase reintegration program, which is offered to qualifying combat veterans (at no cost to them) suffering from PTSD. 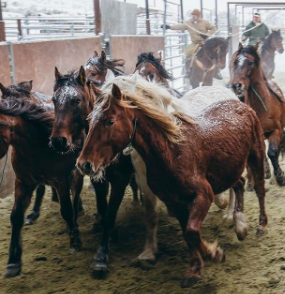 Their program utilizes the remote wilderness of Montana, coupled with human and horse connections, to challenge and inspire personal growth in veterans suffering from mental and physical scars. Their program utilizes expedition-style horse pack trips (led by experienced instructors, many of whom are combat veterans and program graduates themselves) to teach self-reliance, teamwork and perseverance. Their veterans are tasked with various objectives that require them to look within themselves in order to overcome obstacles. The connection that is formed with their horses, as well as the other team members, is not unlike the familiar sense of brotherhood that they experienced while in service, and it is a bond that, for many, remains intact well after the completion of the program. This unique experience challenges these individuals, evokes change, and helps them to develop new ways to approach and solve problems. By challenging what challenges them, veterans can make peace with their past and replace devastating memories with positive ones. Many of the existing programs offered to veterans suffering from PTSD fail when it comes to rehabilitating these individuals in a realistic and sustainable way. The available solutions, many of which include the over-prescribing of medications and shielding from stress-inducing situations, is short-sighted and does not get to the root of the issue. Their veteran program does not provide a short cut, and it does not give you an easy way out. But, what it does give you is the resources and direction to create lasting change. And, perhaps most importantly, their program mandates that you look within yourself to rediscover your inner-strength, confidence, and purpose. Their website is currently updated with their entire herd, and they are offering extra incentives to donors who adopt. They are excited for you to get to know all of the mustangs, horses, and mules that make their program so special. CLICK HERE to take a look! They will also be featuring a “Horse of the Week”, so that you can get to know what makes each of their horses, mules and mustangs so special! MONTHLY GIVING PROGRAM: BECOME A TRAILBLAZER! Their donors are the backbone of this organization – they wouldn’t exist without them. Among their donors, they have a very special sub-group of philanthropists – those who believe so deeply in their mission and approach, that they commit to donating monthly. They refer to those individuals as Heroes and Horses Trailblazers. This group understands the impact that consistent donations can make on their program, and on their ability to grow and scale. CLICK HERE to find out more! As a nonprofit, they rely heavily on in-kind donations – it’s not often that they can just buy what they need. Their Wish List reflects their growing need for better equipment and gear, which will allow them to serve their combat veterans as efficiently as possible. CLICK HERE to check it out! Their donors truly keep their doors open, their horses fed, and most importantly, help make sure their veterans get the help they are looking for. CLICK HERE to donate to Heroes and Horses. Want to give some gear away, instead? Give them a call at (406) 284-2870 to get started! If you are more of a hands-on, get-involved, manual-labor-loving kind of supporter, this is the spot for you! There are a ton of positions to fill every season, and sometimes throughout the rest of the year. They are in the process of filling their 2018 volunteer positions now, so make sure to get your application in if you are interested! CLICK HERE to view the application. Posted in Clinical & Community Preventive Services, Gallatin, Programs and tagged Active, challenge, Community, donations, health, Horses, montana, nonprofit, NOTAVACATION, program, PTSD, purpose, rehabilitation, team, veterans, Volunteer, wellness, wilderness.